What Muscles Are Used While Playing Hockey? Hockey demands speed, quickness, agility and balance, plus the ability to absorb and dish out impacts. You often perform these simultaneously -- such as when you get checked into the boards and try to remain on your skates while fighting for the puck. Hockey's multiple movement patterns use many muscles, particularly in your core and lower body. Knowing which muscles need strengthening helps you train for better performance. Consult your doctor before beginning any exercise regimen. When you skate and kick your legs backward, you perform hip extensions. This motion works your gluteals, which are the largest muscles in the body. The main components are the gluteus maximus, medius and minimus. Barbell deadlifts will strengthen these muscles. Hip abduction is another motion that works your glutes, which occurs when you move your thigh outward while skating. A small muscle on the side of the hip, called the tensor fascia latae, is also targeted during this movement. The quadriceps sit on the front of the thighs and are worked with two motions -- hip flexion and knee extension. During hip flexion, you move your thigh up toward your stomach, while during knee extension, your leg moves from a bent to straight position. Both of these motions take place many times while you skate. The hip flexors, which run from the lower stomach down to the top of the thighs, are also worked when you perform hip flexion. A hanging knees-to-chest leg raise strengthens the quads and hip flexors. The hamstring muscles are on the back of the thighs, right below the glutes. They are worked when you perform hip extension and knee flexion. Knee flexion takes place when you bend your knee and move your heel upward, and when you push your skate backward and lift it off the ice. Standing leg curls, performed on a cable machine, strengthen the hamstrings. The adductors consist of the adductor brevis, longus, magnus and pectineus. These muscles sit on the inside of the thighs. They are worked when you move your leg inward during skating. 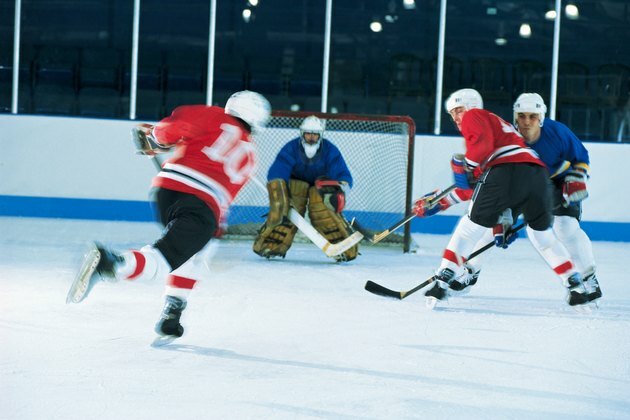 According to The American Journal of Sports Medicine, one of the most frequent hockey injuries is adductor strains. Seated adduction exercises, performed on a machine, work to strengthen these muscles and help prevent injuries. Your core muscles are essential in maintaining your balance during the quick, twisting motions of a fast hockey game. The diagonally shaped oblique muscles sit on the sides of the stomach. During a typical hockey game, you make many twisting motions with your torso while skating, working the puck and taking checks from defenders, which cause you to contract your obliques. Dumbbell side bends strengthen your core muscles, including the obliques. Another of your core muscles, the rectus abdominis is the major muscle in the center of your stomach. You contract this muscle forcefully when explosively skating and when giving and receiving checks. You also contract your abs to remain balanced during skating. Crunches or situps work the rectus abdominis. The muscles of your lower back include the erector spinae, which runs down the vertebral column and ends in your lower back. While playing hockey, you constantly contract this muscle to remain balanced and to stabilize your spine. Back extension exercises strengthen the erector spinae. The American Journal of Sports Medicine; The Effectiveness of a Preseason Exercise Program to Prevent Adductor Muscle Strains in Professional Ice Hockey Players; Timothy F. Tyler, et al. What Muscles Does a Recumbent Bike Use? What Muscles Does Skateboarding Work?